“I’m telling you, your life was flashing in front of you,” one witness said. Country music artist Jason Aldean was performing when the gunfire erupted, Claypool said, causing everyone to panic. “It was pretty eerie because Jason [Aldean] kind of hesitated in his song and I’m thinking, ‘Wow, he’s pretty worried about something’ and then all of a sudden we heard the shots and then I saw him drop his guitar,” Claypool told ABC News today. (David Becker/Getty Images) People run from the Route 91 Harvest country music festival after gun fire was heard, Oct. 1, 2017 in Las Vegas. Claypool said he was sitting in a VIP area near the near the stage when he heard gunshots and began to run. 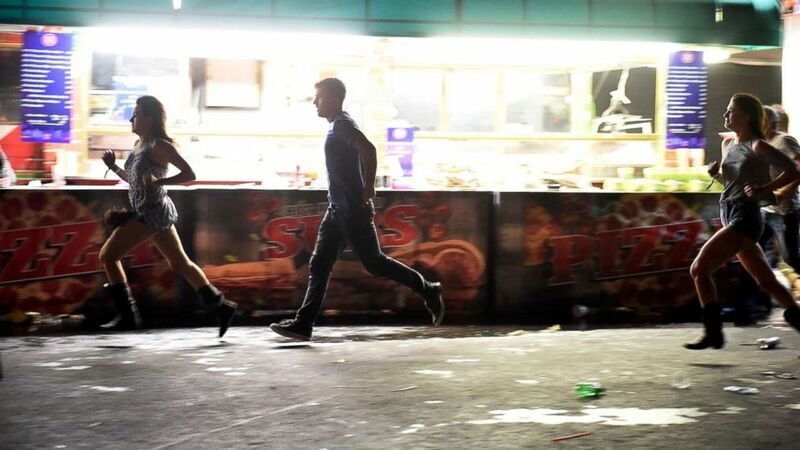 He was among the many concertgoers who were forced to run for their lives late Sunday when the shooter opened fire on the large crowd, killing more than 50 people and injuring at least 400. “I have to tell you, when I was on that ground, that shooting went on for -- it had to have been 20 or 30 seconds,” he said, describing the first burst of gunfire. He said he ran into a little room that he described as a production area with about six young girls who were all crying hysterically. Claypool said he saw two people get shot down and spoke to other witnesses who said they watched their friends die. "It was chaos everywhere" and it was hard to figure out where to run, he said. Claypool said his attendance at the festival Sunday night was “ironic” because he had originally planned to leave Las Vegas on an earlier flight Sunday evening, skipping the last night of the festival. But he said he changed his mind because his view from the 24th floor of the Mandalay Bay Hotel, which he said was similar to the view the shooter had, was “so beautiful” that he decided to stay one more night. Social media video showed witnesses scrambling to flee the scene as shots rang out. Some people were seen crouching on the ground, stumbling over each other, as others attempted to run. Claypool said he was able to make it out without physical harm, but added that the images of the terrifying scene will stay with him forever. “I’m telling you, your life was flashing in front of you,” he said. "The feeling you get is complete helplessness." Claypool said he was “determined” to keep the young women with whom he was sheltering in place safe, and to get home to see his 11-year-old daughter. “I said to myself, ‘These girls aren’t going to die. I’m not going to die. I need to get home to see my daughter. This is not happening. Not happening,” he said.